It is an article of faith in health promotion that health challenges cannot be confronted successfully by actors working in isolation. The synergy produced through collaboration is seen as vital. Yet, collaboration is arduous and many collaborations fade before their goals are met. Research is needed to identify factors and processes that promote as well as inhibit the production of synergistic outcomes. 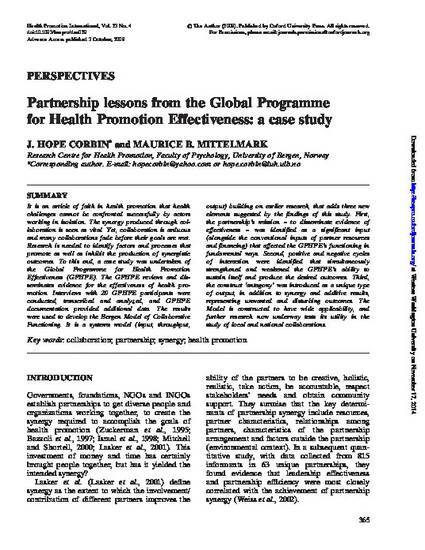 To this end, a case study was undertaken of the Global Programme for Health Promotion Effectiveness (GPHPE). The GPHPE reviews and disseminates evidence for the effectiveness of health pro- motion. Interviews with 20 GPHPE participants were conducted, transcribed and analyzed, and GPHPE documentation provided additional data. The results were used to develop the Bergen Model of Collaborative Functioning. It is a systems model (input, throughput,output) building on earlier research, that adds three new elements suggested by the findings of this study. First, the partnership’s mission – to disseminate evidence of effectiveness – was identified as a significant input (alongside the conventional inputs of partner resources and financing) that affected the GPHPE’s functioning in fundamental ways. Second, positive and negative cycles of interaction were identified that simultaneously strengthened and weakened the GPHPE’s ability to sustain itself and produce the desired outcomes. Third, the construct ‘antagony’ was introduced as a unique type of output, in addition to synergy and additive results, representing unwanted and disturbing outcomes. The Model is constructed to have wide applicability, and further research now underway tests its utility in the study of local and national collaborations.